Nynehead Church of England Primary School, Somerset. 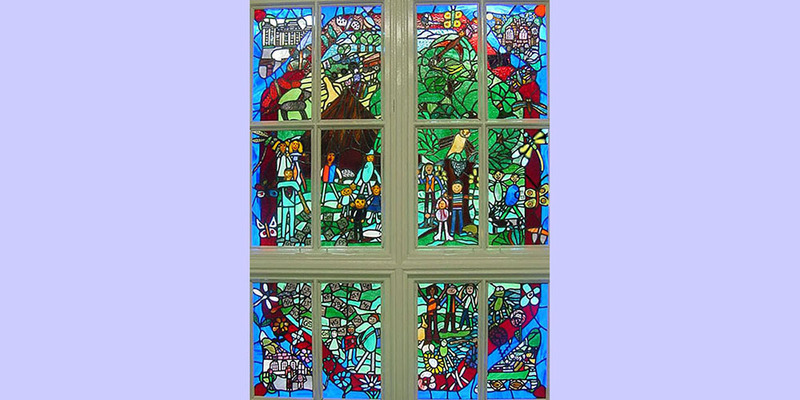 This window was created in loving memory of pupil Jessica Leigh-Firbank. Jessica’s window shows children’s ‘inside’ world of the school playground, with the peaceful and beautiful roundhouse they use as a meeting place. All the pupils who took part have their initials on the stepping stones of the spiral path. In the four corners can be seen the ‘outside’ world with Nynehead Court, Nynehead Church, the canal lift and the school.